You passed the test! :) Will you be stitching those two pieces in the photo?? Beautiful! So say yes. LoL! Who exactly is to be tested? The blogger or the readers? LOL! I stamp this as an A. Looks good to me also - Sandra. Love Stitchers Prayer - I haven't seen that pattern before - It is awesome !!!! ooooo...loving the Lakeside Linen pictured! Is that Pecan Butter? Can't make out the name but it looks yummy! Love the new layout. 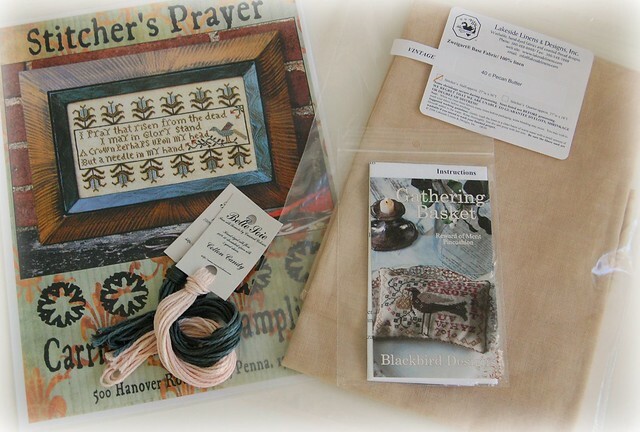 And I'd never seen that Stitcher's Prayer before - I like it! Nice new layout and your stash looks pretty good too.